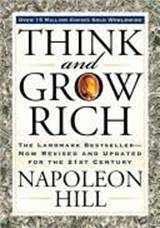 Think and Grow Rich is based upon Napoleon Hill’s “Law of Success” philosophy. Hill developed this philosophy by researching more than forty millionaires to find the answer to the question “What makes a winner?” In the book, Hill imparts his philosophy and provides advice for creating a concrete plan for success that, when followed, never fails. Download this audio discussion addressing a way to face the unknown. The 'Scary Times' Success Manual is an integral concept from The Strategic Coach Program. Used with permission of The Strategic Coach Inc. The Strategic Coach®, Strategic Coach® The Strategic Coach Program, and The 'Scary Times' Success Manual are trademarks of The Strategic Coach Inc. All rights reserved. Download an excellent audio tape illustrating what Jungle Marketing is about. Leveraging Your Small Business for the 21st Century. Crossing the Chasm, a very valuable concept to know if you are starting any company. The book demonstrates the existence of distinct marketing challenges for each market segment in the life cycle of new technology-based products. A significant gulf, the "chasm", exists between the market made up of early adopters, and the markets of more pragmatic buyers. To cross the chasm, a product team must identify the needs of pragmatic buyers. The greater the discontinuous leap in technology, the deeper and wider the chasm will be. Execution is written by Larry Bossidy, former CEO of Allied Signal and Honeywell. This book is a well-written study of Execution as a discipline much the same as other well-written studies on the disciplines of strategy, leadership, etc. Recommended for the CEO of any company that is up and running.